Jason Crouthamel is an Associate Professor of History at Grand Valley State University. His publications include An Intimate History of the Front: Masculinity, Sexuality and German Soldiers in the First World War (2014), The Great War and German Memory: Society, Politics and Psychological Trauma (2009) and two collections coedited with Peter Leese: Psychological Trauma and the Legacies of the First World War and Traumatic Memories of the Second World War and After (both 2016). Michael Geheran is a Postdoctoral Fellow at the Center for Holocaust and Genocide Studies at the United States Military Academy. He is a graduate of Norwich University, Harvard University, and Clark University, where he earned his Ph.D. in 2016. He is currently working on a book based on his doctoral research, which examines the experiences of German-Jewish World War I veterans during the Holocaust. Tim Grady is a Reader in Modern History at the University of Chester. 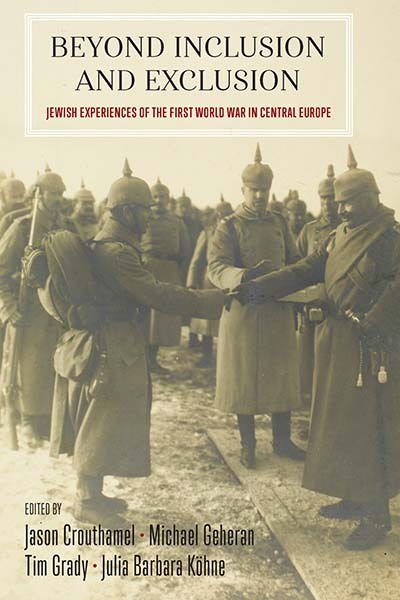 He is also the author of The German-Jewish Soldiers of the First World War in History and Memory (2011), A Deadly Legacy: German Jews and the Great War (2017), and co-editor, with Hannah Ewence, of Minorities and the First World War: From War to Peace (2017). Julia Barbara Köhne is a Visiting Assistant Professor of the History of Culture at Humboldt-Universität in Berlin. She is the author of Geniekult in Geisteswissenschaften und Literaturen um 1900 und seine filmischen Adaptionen (2014), Kriegshysteriker. Strategische Bilder und mediale Techniken militärpsychiatrischen Wissens, 1914–1920 (2009), and co-editor, with Ulrike Heikaus, of Krieg! Juden zwischen den Fronten 1914–1918 (2014). Chapter 5. "Being German" and "Being Jewish" during the First World War: An Ambivalent Transnational Relationship?